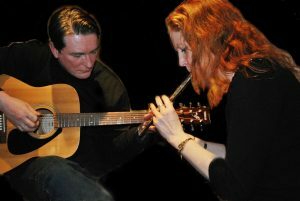 “Simply Rua” comprising outstanding Folk Flutist Jacquelyn Hynes and sublime Irish singer/songwriter J.Eoin reunite for a rare special outing in London’s Slaughtered Lamb. An enchanting and entertaining evening is guaranteed, steeped in urban folklore, with JEoins mesmerising songs of exile and Jacquelyn’s breathtaking original compositions, plus haunting traditional .renditions of the best of Irish and English folk. J Eoin comes from Limerick City – a place made famous in the film Angela’s Ashes for its never-ending rain! He has performed widely and travelled extensively – from Kazakhstan to Norway. His commitment and dedication to live performance and his passion for the art of song writing and song interpretation has sustained and nurtured a long term music career that began at an open door in Ireland and has continued to break on the city shores and the far away oceans across the world today. Jacquelyn’s debut CD “Silver and Wood” was released to critical acclaim in 2014. In 2015, this was followed by a UK tour of Silver and Wood with the Jacquelyn Hynes Trio supported by Arts Council England; an official show-case artist performance at Folk Alliance International in Kansas, M.O. and a solo tour of Italy for Donne in Musica’s Concert Series “Incontri Con Le Compositrici” which featured the works of six female composers and included two of Jacquelyn’s own works.